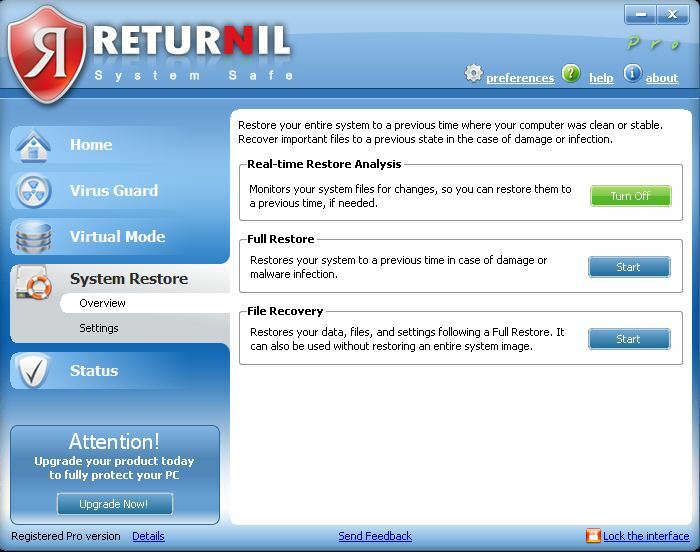 Returnil System Safe 2011 uses an advanced anti-malware and virtualization technology. 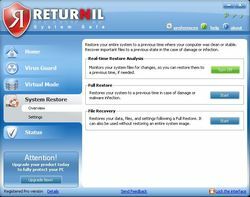 Returnil System Safe 2011 Pro was available as a giveaway on September 28, 2010! How would you improve Returnil System Safe 2011 Pro? Adding option to remove Virus Guard, only the virtual system. I don't understand why people are complaining, this is a great product . and I experienced no slow down at all on my Windows 7. # 39 Thanks Mandate and # 47 Returnil Support, and your website; your suggestions are greatly appreciated. They may help others. I recovered everything! 1. Make sure the Virtual Disk is properly backed up. 2. Install RVS on your new System Partition (usually the C:\ drive for the alternate computer you are accessing the slave drive from). DO NOT install a Virtual Disk at this time. 3. Following the installation/restart, Close the RVS GUI with RVS System Safe in OFF mode, and then copy the RVSYSTEM.img file from the slave drive into the root (hidden) C:\Returnil folder on the new computer. 4. Restart the RVS GUI and then use the link to the right side of the Tools>Virtual Disk section to mount the Virtual Disk. You should now be able to access the data in the old VP and continue to use it in the same way you used it on the previous computer. # 39 Thanks Mandate and # 47 Returnil Support, and your website; your suggestions are greatly appreciated. They may help others. I recovered everything! How do I recover/restore my Virtual Disk To move or reuse an archived Virtual Disk on a new or restored computer, the Virtual Disk (rvsystem.img file) this is the actual file that becomes the Virtual Disk when mounted (open) please do the following: 1. Make sure the Virtual Disk is properly backed up. 2. Install RVS on your new System Partition (usually the C:\ drive for the alternate computer you are accessing the slave drive from). DO NOT install a Virtual Disk at this time. 3. Following the installation/restart, Close the RVS GUI with RVS System Safe in OFF mode, and then copy the RVSYSTEM.img file from the slave drive into the root (hidden) C:\Returnil folder on the new computer. 4. Restart the RVS GUI and then use the link to the right side of the Tools&gt;Virtual Disk section to mount the Virtual Disk. You should now be able to access the data in the old VP and continue to use it in the same way you used it on the previous computer. Great product. Highly recommended! I found this program to be very taxing on my xp 3.0 4g ram. Would not recomend. Thanks G.A.O.T.D. #73, oh no, why GOTD also asks for your email when u comment here? ;) I'm sure Returnil, or any other vendors, are NOT giving your email to any 3rd parties, or use it for advertising. That never happened to me and I've been a user for over a year. Returnil, thanks for the giveaway and being present here by answering all the questions. Much appreciated :) You can clearly see that you take your users/customers seriously, and stand behind your product. Normally here you see people posting crap that doesn't make any sense, so it's great to have someone here who knows how things really are. I like the new version, it takes a little time to get used to it, but isn't it always so with new things. You gotta learn. Strangely returnil installation wouldn't complete on my vista machine, demanding me to first uninstall the older version. I would suggest the developer include the ability to uninstall an older version of its software as part of the process of installing a new version. And if I uninstall the older version and the new version version screws up, then everything will be a mess and not have the older version or the new one if the installation goes as awry as the one on my xp machine. Weird, when I tried to install this, it never got to the point of asking for input of registration key, instead the system spontaneously crashed and rebooted, and this stupid pc won't boot up if there's any drive of any kind plugged into a usb port so I had to quickly unplug my usb portable drive so the system would boot. But after bootup, it had creaetd the program folder and files in it, I tried clicking on the gui exe file, and all I kept getting is an error message about Returnil System safe core system not available. It asked me to reboot again, I did so. But after the second reboot I still get the weird error message. I have no idea what caused the sudden reboot before installation was completed. The only thing I did during installation was to remove the USB drive right after the pc shut down and was starting up again, so that the USB wouldn't prevent the system from being able to boot up. But what do I do now? I don't know why the pc rebooted spontaneously or how to fix the error. Weird, when I tried to install this, it never got to the point of asking for input of registration key, instead the system spontaneously crashed and rebooted, and this stupid pc won't boot up if there's any drive of any kind plugged into a usb port so I had to quickly unplug my usb portable drive so the system would boot. But after bootup, it had creaetd the program folder and files in it, I tried clicking on the gui exe file, and all I kept getting is an error message about Returnil System safe core system not available. It asked me to reboot again, I did so. But after the second reboot I still get the weird error message. I have no idea what caused the sudden reboot before installation was completed. The only thing I did during installation was to remove the USB drive right after the pc shut down and was starting up again, so that the USB wouldn't prevent the system from being able to boot up. But what do I do now? I don't know why the pc rebooted spontaneously or how to fix the error. With so controversy over many issue's with this product.. and from what i can see, many of the 'good' Q's not being answered or resolved it seems a shame but i won't be risking installing this. Thanks GAotD and Returnil all the same. When this was offered in April of 2008, they didn't require you to give out your email address. The only thing that was a problem sometimes with the 2008 giveaway, was that sometimes it would consume so much memory that it would slow down the pc considerably. When this was offered in April of 2008, they didn't require you to give out your email address. The only thing that was a problem sometimes with the 2008 giveaway, was that sometimes it would consume so much memory that it would slow down the pc considerably. WHY do all these developers always want to make you give them your email address and subject yourself to an ever bigger flood of advertising crap that is already so gigantic that it would be impossible to EVER find time to look at it all? I hate it so much that I dread even having to check email, wading through ads looking for important emails is akin to trying to walk in deep thick sucking mud until it clings to your boots so much that you can barely lift your foot to wade out of it. If I want to receive advertising email, let ME DECIDE WHO I WANT TO GET IT FROM & WHEN I WANT TO GET IT, PLEASE! WHY do all these developers always want to make you give them your email address and subject yourself to an ever bigger flood of advertising crap that is already so gigantic that it would be impossible to EVER find time to look at it all? I hate it so much that I dread even having to check email, wading through ads looking for important emails is akin to trying to walk in deep thick sucking mud until it clings to your boots so much that you can barely lift your foot to wade out of it. If I want to receive advertising email, let ME DECIDE WHO I WANT TO GET IT FROM &amp; WHEN I WANT TO GET IT, PLEASE! I have used this program for a few years. This version is much easier to use. I use it on my father-in-law's pc. He surfs into sites around the world where no man should go. Before using this I would have to get him out of serious pc malware 2 or 3 times a week in spite of having every FREE protection available on his pc. His problems were all solved when I started using Returnil program. Now he has no choice but to practice safe computing. His problems helped my find this program and TeamViewer for complete remote support. The only problem is that now I have to remotely turn off Returnil security so I can allow his windows update to function and all the updates to his various programs. Then I turn on security and he is good to go for another 30 days. I have used this program for a few years. This version is much easier to use. I use it on my father-in-law's pc. He surfs into sites around the world where no man should go. Before using this I would have to get him out of serious pc malware 2 or 3 times a week in spite of having every FREE protection available on his pc. His problems were all solved when I started using Returnil program. Now he has no choice but to practice safe computing. His problems helped my find this program and TeamViewer for complete remote support. The only problem is that now I have to remotely turn off Returnil security so I can allow his windows update to function and all the updates to his various programs. Then I turn on security and he is good to go for another 30 days. I have read with interest (and concerns, we all know about Nt...) all the comments about resources utilization of returnil. I have been using the trial version for about a month, and I can assure you that no system 'hog' exist. Returnil has been running smoothly and detected quite a few malwares that were dormant in my system (and undetected by other antiviral or antimalware programs). I am quite happy with the occasion to get it for free for a while. I am therefore registering it for all my computers. @#56 (brasscupcakes): "Q. ...I realize the free version doesn’t have AV, but the free version also doesn’t have the file manager, without which you can’t save files generated during virtual mode." Returnil Support: The AV will still work in the free version of RSS. What is not available is the full system scan. As for saving files, the free edition provide the same Virtual Disk (alternate storage for those without extra partitions) and you can always save files and data on a non-system disk or partition (data drive D:\, USB drive F:\, etc). @#57 (Whisperss): "Q. ...I don’t install my programs on the C: drive but rather do so on another partition...I understand that C: is protected but if I never install progs other than the OS and its updates onto that drive (I keep it deliberately small), will Returnil’s program still give the virtualization & ability to save changes across multiple partitions... or will I have to install a program onto C: within the virtualization...? Returnil Support: You don't have to change a thing as your approach is a valid way to work efficiently with virtualization. Yes, you will still be able to save your files and data on the non-system partitions/disks and can even use the Virtual Disk if you need a place to save on the system partition for whatever reason. @#61 (dan): "Q. Does SYSTEM SAFE 2011 conflict with COMODO TIME MACHINE? WONDERSHARE TIME FREEZE warned that TIME FREEZE & TIME MACHINE should not be installed on the same PC." Returnil Support: The evidence is mixed. Some report no issues whatsoever and others report potential problems. Until there is a definitive answer here, you should consider installing RSS Pro 2011 sans CTM. @#63 (Evan): "Q. Wouldn’t install properly. At the end of the installation process, got blue screen of death with rvssys.mon being the culprit. Rebooted, reinstalled, same thing." Returnil Support: Please see the replies in posts 40/47 and use the same address to shoot us a note through our support system. Please include the logs we asked others for so we can investigate this quickly. Thank you in advance for the log files and detailed report. @#56 (brasscupcakes): "Q. ...I realize the free version doesn’t have AV, but the free version also doesn’t have the file manager, without which you can’t save files generated during virtual mode." Returnil Support: The AV will still work in the free version of RSS. What is not available is the full system scan. As for saving files, the free edition provide the same Virtual Disk (alternate storage for those without extra partitions) and you can always save files and data on a non-system disk or partition (data drive D:\, USB drive F:\, etc). @#57 (Whisperss): "Q. ...I don’t install my programs on the C: drive but rather do so on another partition...I understand that C: is protected but if I never install progs other than the OS and its updates onto that drive (I keep it deliberately small), will Returnil’s program still give the virtualization &amp; ability to save changes across multiple partitions... or will I have to install a program onto C: within the virtualization...? Returnil Support: You don't have to change a thing as your approach is a valid way to work efficiently with virtualization. Yes, you will still be able to save your files and data on the non-system partitions/disks and can even use the Virtual Disk if you need a place to save on the system partition for whatever reason. @#61 (dan): "Q. Does SYSTEM SAFE 2011 conflict with COMODO TIME MACHINE? WONDERSHARE TIME FREEZE warned that TIME FREEZE &amp; TIME MACHINE should not be installed on the same PC." Returnil Support: The evidence is mixed. Some report no issues whatsoever and others report potential problems. Until there is a definitive answer here, you should consider installing RSS Pro 2011 sans CTM. @#63 (Evan): "Q. Wouldn’t install properly. At the end of the installation process, got blue screen of death with rvssys.mon being the culprit. Rebooted, reinstalled, same thing." Returnil Support: Please see the replies in posts 40/47 and use the same address to shoot us a note through our support system. Please include the logs we asked others for so we can investigate this quickly. Thank you in advance for the log files and detailed report. @#55 (Spredo): "Q1. But I would still like to know WHAT the program tries to send you. The license-agreement says the program will send you more or less whatever it wants." 2. Signature and cloud updates: Client quiries the server for updated information and then the server sends either a good-to-go message (already updated) or will download the updates identified by the server. 3. Malware sample and behavioral data: this is exactly what it means and is used by our server side AI/Machine learning technology to identify new, potential malware as well as to provide a means for reducing false positive detections. "Q2. Some sort of reduced functionality would be acceptable, i.e. “this will not work if you do not send this information to parent-company, send yes/no” and the option to see what is being sent. (I am not against giving you information, I just want to know what I am sending you)"
Returnil Support: You do not have to connect to the internet for RSS to function. This will result in reduced functionality as the software will default to the free, unregistered version. For a registered version, the only connection you need to make is the license registration. Once this is complete, and the premium features unlocked by your license, the software will not require any further contact. "Q3. ANOTHER issue: After reboot, the program shut down all my protection software (Panda, Ad-aware and windows defender). Not a good way to make me trust the program." 1. Disk defragmentation: all attempts to defragemnt your disks while the Virtual Mode is active will be terminated. This is to protect your system files from damage. 2. Imaging is also terminated for the same reason. If Panda, AAW, and WD are being deactivated on your system, it is not because of anything RSS is doing, will do, or would do. It makes no sense from a security perspective to do that and we regularly QC against these programs in our general pre-release lab testing. To date, we have not experienced or discovered any issues. Would it be possible to get a video (in VMWARE or other?) showing this happening? @#55 (Spredo): "Q1. But I would still like to know WHAT the program tries to send you. The license-agreement says the program will send you more or less whatever it wants." Returnil Support: The program sends: 1. Registration information your enter through the registration screen and some general aggregate information that allows us to quickly identify your copy of the software for technical support reasons (resetting passwords, reassigning licensing with a fresh install, investigating issue reports and their resolution) 2. Signature and cloud updates: Client quiries the server for updated information and then the server sends either a good-to-go message (already updated) or will download the updates identified by the server. 3. Malware sample and behavioral data: this is exactly what it means and is used by our server side AI/Machine learning technology to identify new, potential malware as well as to provide a means for reducing false positive detections. 4. Alert messages "Q2. Some sort of reduced functionality would be acceptable, i.e. “this will not work if you do not send this information to parent-company, send yes/no” and the option to see what is being sent. (I am not against giving you information, I just want to know what I am sending you)" Returnil Support: You do not have to connect to the internet for RSS to function. This will result in reduced functionality as the software will default to the free, unregistered version. For a registered version, the only connection you need to make is the license registration. Once this is complete, and the premium features unlocked by your license, the software will not require any further contact. "Q3. ANOTHER issue: After reboot, the program shut down all my protection software (Panda, Ad-aware and windows defender). Not a good way to make me trust the program." Returnil Support: RSS will not interfere or attempt to deactivate anything on your system with the following exceptions: 1. Disk defragmentation: all attempts to defragemnt your disks while the Virtual Mode is active will be terminated. This is to protect your system files from damage. 2. Imaging is also terminated for the same reason. If Panda, AAW, and WD are being deactivated on your system, it is not because of anything RSS is doing, will do, or would do. It makes no sense from a security perspective to do that and we regularly QC against these programs in our general pre-release lab testing. To date, we have not experienced or discovered any issues. Would it be possible to get a video (in VMWARE or other?) showing this happening? I have loved Returnil when I first found it here as a Giveaway and have used it ever since. However, I recently went back to an image on my laptop and needed to install a new version of Returnil since the one installed with the image had run out. I downloaded a free version and installed it. It didn't really slow the pc, but I was unhappy with the popup's, the unability to install a program from here it deemed unsafe and that there was no Exit button. I now also severely dislike that in order to get "Uninstall" info I had to go to the website and the FAQ instead of finding any info in the manual. To make a long story short: I went back to the last free version of 2008 just yesterday and I will still with that for the rest of the days. I have loved Returnil when I first found it here as a Giveaway and have used it ever since. However, I recently went back to an image on my laptop and needed to install a new version of Returnil since the one installed with the image had run out. I downloaded a free version and installed it. It didn't really slow the pc, but I was unhappy with the popup's, the unability to install a program from here it deemed unsafe and that there was no Exit button. I now also severely dislike that in order to get "Uninstall" info I had to go to the website and the FAQ instead of finding any info in the manual. To make a long story short: I went back to the last free version of 2008 just yesterday and I will still with that for the rest of the days. disappointed at the system ‘slow down’ can not post to clipmarks take off now I can I an on dial-up but I prefer Sandboxie & Wondershare Time Freeze given can run 2 at the same time & it not slow can you fix it ? disappointed at the system ‘slow down’ can not post to clipmarks take off now I can I an on dial-up but I prefer Sandboxie &amp; Wondershare Time Freeze given can run 2 at the same time &amp; it not slow can you fix it ? (Somehow this informer thing don't allow posting ideas right now). Make locking (or writing to) the MBR optional. Writing/locking the MBR can be hazardous. Programs such as Acronis need to access it too,when using F12 to launch restore. Some pre-installed windows even have a manufacturer's restore partition that needs to be accessed at boot time (when needed). Another suggestion would be to make antivirus protection optional too,to preserve system resources. (Somehow this informer thing don't allow posting ideas right now). Some friendly remarks towards the developer... Make locking (or writing to) the MBR optional. Writing/locking the MBR can be hazardous. Programs such as Acronis need to access it too,when using F12 to launch restore. Some pre-installed windows even have a manufacturer's restore partition that needs to be accessed at boot time (when needed). Another suggestion would be to make antivirus protection optional too,to preserve system resources. Plus it would be nice if Returnil had its own sandboxing feature to test-run or launch separate programs.If not even Returnil's virtual windows can be screwed up at any time... My 2cents anyway. Wouldn't install properly. At the end of the installation process, got blue screen of death with rvssys.mon being the culprit. Rebooted, reinstalled, same thing. Not sure if I'm going to keep this program, need to test it for a while. But you ( I ) have to take notice of how diligent the Returnil tech support is in responding to the gotd comments. I don't remember when I saw so many quick responses to the questions and comments. Does SYSTEM SAFE 2011 conflict with COMODO TIME MACHINE? WONDERSHARE TIME FREEZE warned that TIME FREEZE & TIME MACHINE should not be installed on the same PC. Does SYSTEM SAFE 2011 conflict with COMODO TIME MACHINE? WONDERSHARE TIME FREEZE warned that TIME FREEZE &amp; TIME MACHINE should not be installed on the same PC. Simply use your backup CD's to install to a free program like VirtualBox, :D Wayyyyy less resource intensive. I did not give the A/V portion of Returnil System Safe 2011 a good workout, though I can say it's less intrusive than both the McAfee Internet Sec. 2010 I'm using right now, & the free Microsoft A/V software I use in several VMs [Virtual Machines] -- & that is allowing for System Safe not including a firewall. Likewise I didn't really pursue using System Safe's virtual disk, because to me it's more practical to use separate software for virtual disks than can be accessed anywhere, regardless any Returnil apps or not -- e.g. Dell KACE has a free app for that, you can use TrueCrypt, & it's built into win7 [& can be added to XP onward]. The reason behind using a virtual disk in this case, is that by default only the system hard drive is protected by Returnil's virtualization [when like Time Freeze it's writing to the temporary swap file instead of the disk itself], so by saving any docs etc. to another drive/partition, they'll still be there when you turn virtualization off. If you don't have a 2nd drive/partition where you can save that stuff, a virtual disk can work the same way -- when mounted Windows sees it as another, separate drive. What I did was after checking it out in a VM, I installed Returnil System Safe 2011 in win7 ult 64, after performing a full disk image backup. Then with System Safe's virtualization turned on, I installed a video app I wanted to try, & had it start processing/writing a huge amount of video... reading/writing to hdd was a lot slower than normal, & maybe 1/4 of the way through the app locked. That doesn't mean it's a bad choice for everyone -- Time Freeze isn't on GOTD today, And it doesn't offer everything System Safe 2011 does, plus Returnil's app works with large display fonts in 7 -- Time Freeze won't, which is why I was so interested in today's GOTD. Far as details go, the GOTD setup opens a WinRAR self-extractor that write the *real*, uncompressed setup file where **You** tell it to -- if like me the last time you used this self-extractor was with a Pargon app, it'll still show the target folder you used that time. The *real* setup uses the Windows Installer to add System Safe plus it's 4 driver files. I got a Lot of garbage entries recorded in 7 ult 64, but as best I can tell it's not much different than the ~450 adds I recorded in the XP VM [differences I spotted were just using the Wow6432Node keys in 7 64]. The Windows Installer means 3 files + 1 folder added to the Windows\Installer folder, & System Safe adds 1 folder to [UserName]\ AppData\Roaming in 7, [UserName]\Application Data in XP. A folder's added to All Users \ App Data as well, plus in 7 it's duplicated in Program Data -- it held the temporary swap or cache file [~60MB] & the auto-downloaded update [~50MB]. The app itself takes up about 13MB in 14 files, 3 folders. Once installed those 4 drivers are registered as services, plus there's a service you'll find added to Admin Tools -> Services set to start with Windows. A shortcut for the app's GUI is added to the Start Menu Startup folder rather than the registry to auto-start with Windows. For me the hassle of having to log out, setting display fonts to normal size so I can use Time Freeze is something I'll have to continue putting up with... with some projects &/or renders taking hours & hours, I'm not willing to risk it with System Safe. Returnil System Safe 2011, like Wondershare's Time Freeze (a recent GOTD), can intercept anything headed for your system hard drive, &amp; store it in a temporary swap file instead... this goes for new files, changes to files, &amp; changes &amp;/or adds to Window's registry. Returnil goes further though, providing AntiVirus protection, plus a method of writing selected files to the real hard drive when you want to stop using this swap file -- with Time Freeze it's an all or nothing proposition. Returnil System Safe 2011 can also provide a virtual disk [more on this later], &amp; can provide an interface to Windows shadow copies. AS with most AntiVirus apps, you get a subscription, today's good until March 2011. As luck would have it I had a project that I had planned on using Time Freeze for today, &amp; so I gave it to Returnil instead... unfortunately for an as yet unknown reason it failed. :-( TIme Freeze is doing OK [Knock Wood] as I type this. :-) I did not give the A/V portion of Returnil System Safe 2011 a good workout, though I can say it's less intrusive than both the McAfee Internet Sec. 2010 I'm using right now, &amp; the free Microsoft A/V software I use in several VMs [Virtual Machines] -- &amp; that is allowing for System Safe not including a firewall. Likewise I didn't really pursue using System Safe's virtual disk, because to me it's more practical to use separate software for virtual disks than can be accessed anywhere, regardless any Returnil apps or not -- e.g. Dell KACE has a free app for that, you can use TrueCrypt, &amp; it's built into win7 [&amp; can be added to XP onward]. The reason behind using a virtual disk in this case, is that by default only the system hard drive is protected by Returnil's virtualization [when like Time Freeze it's writing to the temporary swap file instead of the disk itself], so by saving any docs etc. to another drive/partition, they'll still be there when you turn virtualization off. If you don't have a 2nd drive/partition where you can save that stuff, a virtual disk can work the same way -- when mounted Windows sees it as another, separate drive. What I did was after checking it out in a VM, I installed Returnil System Safe 2011 in win7 ult 64, after performing a full disk image backup. Then with System Safe's virtualization turned on, I installed a video app I wanted to try, &amp; had it start processing/writing a huge amount of video... reading/writing to hdd was a lot slower than normal, &amp; maybe 1/4 of the way through the app locked. That doesn't mean it's a bad choice for everyone -- Time Freeze isn't on GOTD today, And it doesn't offer everything System Safe 2011 does, plus Returnil's app works with large display fonts in 7 -- Time Freeze won't, which is why I was so interested in today's GOTD. Far as details go, the GOTD setup opens a WinRAR self-extractor that write the *real*, uncompressed setup file where **You** tell it to -- if like me the last time you used this self-extractor was with a Pargon app, it'll still show the target folder you used that time. The *real* setup uses the Windows Installer to add System Safe plus it's 4 driver files. I got a Lot of garbage entries recorded in 7 ult 64, but as best I can tell it's not much different than the ~450 adds I recorded in the XP VM [differences I spotted were just using the Wow6432Node keys in 7 64]. The Windows Installer means 3 files + 1 folder added to the Windows\Installer folder, &amp; System Safe adds 1 folder to <em>[UserName]</em>\ AppData\Roaming in 7, <em>[UserName]</em>\Application Data in XP. A folder's added to All Users \ App Data as well, plus in 7 it's duplicated in Program Data -- it held the temporary swap or cache file [~60MB] &amp; the auto-downloaded update [~50MB]. The app itself takes up about 13MB in 14 files, 3 folders. Once installed those 4 drivers are registered as services, plus there's a service you'll find added to Admin Tools -&gt; Services set to start with Windows. A shortcut for the app's GUI is added to the Start Menu Startup folder rather than the registry to auto-start with Windows. For me the hassle of having to log out, setting display fonts to normal size so I can use Time Freeze is something I'll have to continue putting up with... with some projects &amp;/or renders taking hours &amp; hours, I'm not willing to risk it with System Safe. It's very nice to see the publisher come here to address our concerns. That is always a plus in my eyes. I got Returnil from GAOTD when there was no subscription. That is the only fault I find with this program. No one want to pay rent for a program. That is why I will not install it. No matter what any one says, programs that have an expiration date are no better to me than shareware. They just last a little longer. Thank you GAOTD team for your efforts and to the publisher, Returnil for the offer. OK so I read thru all the posts plus Returnil's answers (thanks BTW for being so responsive) but my question is not answered so far as I can tell so here you go: I don't install my programs on the C: drive but rather do so on another partition which allows me to reformat/restore C: without having to reinstall all of my programs afterward. I understand that C: is protected but if I never install progs other than the OS and its updates onto that drive (I keep it deliberately small), will Returnil's program still give the virtualization & ability to save changes across multiple partitions or will I have to install a program onto C: within the virtualization and if I want to keep it I then have to reinstall it onto the drive I want? This would be a deal breaker for me because I have absolutely NO interest in re-partitioning my HDD just to try software out. OK so I read thru all the posts plus Returnil's answers (thanks BTW for being so responsive) but my question is not answered so far as I can tell so here you go: I don't install my programs on the C: drive but rather do so on another partition which allows me to reformat/restore C: without having to reinstall all of my programs afterward. I understand that C: is protected but if I never install progs other than the OS and its updates onto that drive (I keep it deliberately small), will Returnil's program still give the virtualization &amp; ability to save changes across multiple partitions or will I have to install a program onto C: within the virtualization and if I want to keep it I then have to reinstall it onto the drive I want? This would be a deal breaker for me because I have absolutely NO interest in re-partitioning my HDD just to try software out. does anyone know if there is definitely an option to install this without the built-in anti-virus protection, as was possible in previous pro versions? I realize the free version doesn't have AV, but the free version also doesn't have the file manager, without which you can't save files generated during virtual mode. does anyone know if there is definitely an option to install this without the built-in anti-virus protection, as was possible in previous pro versions? I realize the free version doesn't have AV, but the free version also doesn't have the file manager, without which you can't save files generated during virtual mode. Thank you for taking the time to address comments made by GAOTD users. I hear what you have to say about the "phone home"-bit, and I understand your position in this. But I would still like to know WHAT the program tries to send you. The license-agreement says the program will send you more or less whatever it wants. ANOTHER issue: After reboot, the program shut down all my protection software (Panda, Ad-aware and windows defender). Not a good way to make me trust the program. @ 43 (Returnil Support) Thank you for taking the time to address comments made by GAOTD users. I hear what you have to say about the "phone home"-bit, and I understand your position in this. But I would still like to know WHAT the program tries to send you. The license-agreement says the program will send you more or less whatever it wants. Some sort of reduced functionality would be acceptable, i.e. "this will not work if you do not send this information to parent-company, send yes/no" and the option to see what is being sent. (I am not against giving you information, I just want to know what I am sending you) ANOTHER issue: After reboot, the program shut down all my protection software (Panda, Ad-aware and windows defender). Not a good way to make me trust the program. Is this correct or a mistake? Only 6 month License? Is this correct or a mistake? @#39 (ManDate): "Q. It has been long known that Returnil kills the System Restore points of the Windows Operating system. That is the most disappointed part of the Returnil." Returnil Support: The issue you describe should be resolved and did not destroy existing restore points. Further, this was specific to Windows XP and was not universal. What happened was that the LIST of existing restore points was lost on some XP systems. Once RVS 2010 was uninstalled, the restore points "reappeared". Please try RSS Pro 2011 to verify that this is resolved on your system. @#45 (Jorge-6025): "Q. Hey Returnil!! Thank you for giving me a non-fixable bluescreen of death!! I will no longer support your products and will tell all my friends not to use your software!!..." Returnil Support: This is unexpected and indicates a conflict with something else installed on your system. Please open a support ticket and send a MSINFO32 report (the other logs gone with the restore) so we can open an investigation to discover the root cause of your critical stop. For other readers, please be cautious when trying new software. It is impossible for any developer to account for every potential configuration and setup so conflicts between software can and do occur. We suggest trying RSS Pro 2011 alone and then add complexity afterwards, slowly, so you have a chance to evaluate any potential conflicts. @#39 (ManDate): "Q. It has been long known that Returnil kills the System Restore points of the Windows Operating system. That is the most disappointed part of the Returnil." Returnil Support: The issue you describe should be resolved and did not destroy existing restore points. Further, this was specific to Windows XP and was not universal. What happened was that the LIST of existing restore points was lost on some XP systems. Once RVS 2010 was uninstalled, the restore points "reappeared". Please try RSS Pro 2011 to verify that this is resolved on your system. @#45 (Jorge-6025): "Q. Hey Returnil!! Thank you for giving me a non-fixable bluescreen of death!! I will no longer support your products and will tell all my friends not to use your software!!..." Returnil Support: This is unexpected and indicates a conflict with something else installed on your system. Please open a support ticket and send a MSINFO32 report (the other logs gone with the restore) so we can open an investigation to discover the root cause of your critical stop. For other readers, please be cautious when trying new software. It is impossible for any developer to account for every potential configuration and setup so conflicts between software can and do occur. We suggest trying RSS Pro 2011 alone and then add complexity afterwards, slowly, so you have a chance to evaluate any potential conflicts. @#32 (Player 85): "Q. If you installed Wondershare Time Freeze a few weeks ago DO NOT install this. It caused issues on my machine and I had to do a system restore." Returnil Support: The first question I would have here is why anyone would want or need to use two programs that do essentially the same thing on the same computer. WTF is redundant to the Virtual Mode in RSS Pro so the use of them together is counterintuitive. Also WTF is a boot-to-restore solution and not a security solution so the level of protection and purpose are vastly different as described in several previous replies. @#34 (XaosLin): "Q. It shut my computer down with a blue screen"
Returnil Support: Please see my previous replies (#'s 40 and 47) for the logs we need to investigate this report further. The most likely cause is conflict with another program on your computer and the logs will help us identify the root cause. Thank you in advance for your report. @#36 (Bob2020): "Q1. Anti-virus in a virtual system is oxymoron, why you ask, well it defeats the purpose of virtual parallel operating system by occupying memory and then destructs itself when shut down. How would you know that there was something wrong with the site visited or new program installed that was causing the problem..."
Returnil Support: You answered your own question: AV is needed to identify and warn of the presence of malware as well as to block its activation, further protecting your system; especially from those rare families that are designed specifically to circumvent virtualization. "Q2. ...Furthermore, constantly rebooting back and forth is nuisance and many times you will mix them up and install or download into virtual machine and then lose it..."
Returnil Support: This is why we have added a new mouse over disply that will show the current Virtual Mode and Virus Guard statuses. Simply hover your mouse over the tray icon and/or desktop toolbar and you will see the status at a glance, thus avoiding any issues where you forget whether the Virtual Mode is active or not. "Q3. ...According to my tests, the software is CPU intensive and takes up to 33% of the CPU time slices and makes everything runs to slow, like you are using an inferior computer." Returnil Support: if you are encountering performance issues, trim the herd and try RSS Pro alone. You do not need to supplement RSS as you do other, ISR only solutions. "Q4. ...If you load Winword or any spread sheet software, good luck with it, your system will freeze. Not worth it to even try it, you will mess up the original registry and cleaning it is a time consuming." Returnil Support: completely untrue. If your system is effected negatively by opening an Office document and running a security solution at the same time, it may be time to upgrade your computer hardware or move to a modern system. The minimum hardware specifications are detailed on the website and in both the PDF and integrated help manuals for the software. @#37 (Snickers Too): "Q. Whats the difference between this and “System Restore” on my Vista machine?" Returnil Support: They both use the integrated Windows Volume Shadow Copy feature to create restore points. Where RSS is different is that these points are monitored for malware and the program allows for restoration of individual system files whereas the Windows feature only allows a full restore to an earlier time. RSS allows both. @#32 (Player 85): "Q. If you installed Wondershare Time Freeze a few weeks ago DO NOT install this. It caused issues on my machine and I had to do a system restore." Returnil Support: The first question I would have here is why anyone would want or need to use two programs that do essentially the same thing on the same computer. WTF is redundant to the Virtual Mode in RSS Pro so the use of them together is counterintuitive. Also WTF is a boot-to-restore solution and not a security solution so the level of protection and purpose are vastly different as described in several previous replies. @#34 (XaosLin): "Q. It shut my computer down with a blue screen" Returnil Support: Please see my previous replies (#'s 40 and 47) for the logs we need to investigate this report further. The most likely cause is conflict with another program on your computer and the logs will help us identify the root cause. Thank you in advance for your report. @#36 (Bob2020): "Q1. Anti-virus in a virtual system is oxymoron, why you ask, well it defeats the purpose of virtual parallel operating system by occupying memory and then destructs itself when shut down. How would you know that there was something wrong with the site visited or new program installed that was causing the problem..." Returnil Support: You answered your own question: AV is needed to identify and warn of the presence of malware as well as to block its activation, further protecting your system; especially from those rare families that are designed specifically to circumvent virtualization. "Q2. ...Furthermore, constantly rebooting back and forth is nuisance and many times you will mix them up and install or download into virtual machine and then lose it..." Returnil Support: This is why we have added a new mouse over disply that will show the current Virtual Mode and Virus Guard statuses. Simply hover your mouse over the tray icon and/or desktop toolbar and you will see the status at a glance, thus avoiding any issues where you forget whether the Virtual Mode is active or not. "Q3. ...According to my tests, the software is CPU intensive and takes up to 33% of the CPU time slices and makes everything runs to slow, like you are using an inferior computer." Returnil Support: if you are encountering performance issues, trim the herd and try RSS Pro alone. You do not need to supplement RSS as you do other, ISR only solutions. "Q4. ...If you load Winword or any spread sheet software, good luck with it, your system will freeze. Not worth it to even try it, you will mess up the original registry and cleaning it is a time consuming." Returnil Support: completely untrue. If your system is effected negatively by opening an Office document and running a security solution at the same time, it may be time to upgrade your computer hardware or move to a modern system. The minimum hardware specifications are detailed on the website and in both the PDF and integrated help manuals for the software. @#37 (Snickers Too): "Q. Whats the difference between this and “System Restore” on my Vista machine?" Returnil Support: They both use the integrated Windows Volume Shadow Copy feature to create restore points. Where RSS is different is that these points are monitored for malware and the program allows for restoration of individual system files whereas the Windows feature only allows a full restore to an earlier time. RSS allows both. This USED to be a really good program... then they added all of the virus scanning part to it and really effed it up big time... I used this about 2 or 3 years ago and it was great, but I wouldn't waste my time on it now. As others have mentioned, it is system intensive. Why would you need virus and malware scanners in a virtual system program anyway? In my opinion, that's just bloatware. You can try to sell it all you want, but that's what it is. I just want a virtual system that loses changes at reboot... nothing fancy, nothing more. For that reason, I'm using the Wondershare Time Freeze that was offered here a while back.. It does what Returnil used to do. Returnil, you had a great program... get back to your roots. I am disappointed with this version as it will not install on my computer (XP sp3). I have used previous versions and love the program but no matter how many times I try to install this on I get an error message that the installation has ended prematurely and that Returnil has rolled back changes and that I should reboot and reinstall but I get the same error message each time I try to reinstall. Sure wish this would have worked for me. Anyone else have a similar experience? Any suggestions will be appreciated. @#28 (G): "Q. ...Because it is block level, they can’t do it for SMB shares, so any virus that tries to write anywhere other than drive C will likely still succeed...Wondershare Timefreeze is like the earlier version of Returnil before the bloatware features were added." Returnil Support: RSS is not "bloatware" which implies the type of pile on "integration" used by Symantec in the early 2000's. RSS is not a suit, it is an integrated, intelligent layering approach that takes the best aspects of the separate technologies so they work together for the same goal rather than work to step all over each other. Regarding installation of malware on no-virtualized disks and partitions, you are correct when only looking at the Virtual Mode feature as is true for all boot-to-restore approaches. This is partly why the Anti-execute and File Protection features are included. 1. AE: If it can't execute, it can't infect. 2. File Protection: removes ability for malware to make changes to protected files and folders on non-system disks. To compare with RSS, you need to install a virtualization app, an AV app, and AE app, and a restore app - that is more likely to result in bloat than using RSS Pro 2011 as intended, with all protection features active, and used alone even though it is designed to be used in combination with other security solutions. This is not because we believe that RSS needs the help, it doesn't; but many potential users either have concurrent licensing and uncertainty about going to a new approach. We recognize both and work to provide as wide a support as possible so that there is little interruption to said customer while they reach their decision point. @#28 (G): "Q. ...Because it is block level, they can’t do it for SMB shares, so any virus that tries to write anywhere other than drive C will likely still succeed...Wondershare Timefreeze is like the earlier version of Returnil before the bloatware features were added." Returnil Support: RSS is not "bloatware" which implies the type of pile on "integration" used by Symantec in the early 2000's. RSS is not a suit, it is an integrated, intelligent layering approach that takes the best aspects of the separate technologies so they work together for the same goal rather than work to step all over each other. Regarding installation of malware on no-virtualized disks and partitions, you are correct when only looking at the Virtual Mode feature as is true for all boot-to-restore approaches. This is partly why the Anti-execute and File Protection features are included. 1. AE: If it can't execute, it can't infect. 2. File Protection: removes ability for malware to make changes to protected files and folders on non-system disks. To compare with RSS, you need to install a virtualization app, an AV app, and AE app, and a restore app - that is more likely to result in bloat than using RSS Pro 2011 as intended, with all protection features active, and used alone even though it is designed to be used in combination with other security solutions. This is not because we believe that RSS needs the help, it doesn't; but many potential users either have concurrent licensing and uncertainty about going to a new approach. We recognize both and work to provide as wide a support as possible so that there is little interruption to said customer while they reach their decision point. @#20 (saturno9): "Q. Program starts after reboot,program told me Returnil System Safe 2011 core system is not available! Program do not starts after reboot,And the only thing I can do about it is close the program." Returnil Support: Please see the instructions supplied to "Damon" in post #40. Send us the same logs and we can investigate the issue. The most likely cause is an incompatibility with something you have installed now or a remnant of a program you may have installed in the past. @#21 (Sus): "Q1. * Installation (XpPro SP3) was quite well, but I saw a blue screen at the end, after choosing the manual restart;..."
1. C:\Windows\MINIDUMP: lookm for files with the same date and time as the BSOD. 2. C:\Windows\MEMORY.DMP: If this file exists, it may be too large to send via e-mail attachment. If this is valid in your case, please let us know in your message and we will reply with credentials you can use to upload the file to our servers directly via FTP. "Q2. * The ” additional security ” (if there is any) i get by using Returnil does not justify the loss of resources (memory + cpu) i.e. speed;..."
Returnil Support: performance issues are usually related to using redundant security solutions. To get a true feel for RSS' effectiveness, you should try it as a stand alone solution. With a VB100 award, you should be confident of its quality and effectiveness. "Q3. * The combination of a standard AV + Sandboxie is more efficient, particularly when it comes to mid- and low-end cpu;..."
@#22 (Deb): "Q. ...Get a hold of the Returnil 2008 Personal Edition if 2011 Pro gives you too much grief." Returnil Support: if you are looking for strict virtualization you should try RVS Lite 2011. It is closer to the RVS 2008 model, includes multi-disk virtualization with extras, an included stand-alone remote management console for use in isolated networks, a targeted System Guard feature that provides specific protection against virtualization circumventing malware, all in an installer less than 4MB! @#24 (Ansor): "Q. ... Annoying Returnil box popped up saying “Core stopped” which when coupled with the fact that shutting down the PC seemed to freeze the system meant I uninstalled it." Returnil Support: Please try another installation and if the same issues happen, send us the logs asked for in post #40. In the new install attempt, please try RSS Pro alone and include the result of this in your report to tech support address. Thanks in advance for the report and test. @#20 (saturno9): "Q. Program starts after reboot,program told me Returnil System Safe 2011 core system is not available! Program do not starts after reboot,And the only thing I can do about it is close the program." Returnil Support: Please see the instructions supplied to "Damon" in post #40. Send us the same logs and we can investigate the issue. The most likely cause is an incompatibility with something you have installed now or a remnant of a program you may have installed in the past. @#21 (Sus): "Q1. * Installation (XpPro SP3) was quite well, but I saw a blue screen at the end, after choosing the manual restart;..." Returnil Support: In addition to the logs asked for above, please include the following in a support e-mail to the same address: 1. C:\Windows\MINIDUMP: lookm for files with the same date and time as the BSOD. 2. C:\Windows\MEMORY.DMP: If this file exists, it may be too large to send via e-mail attachment. If this is valid in your case, please let us know in your message and we will reply with credentials you can use to upload the file to our servers directly via FTP. "Q2. * The ” additional security ” (if there is any) i get by using Returnil does not justify the loss of resources (memory + cpu) i.e. speed;..." Returnil Support: performance issues are usually related to using redundant security solutions. To get a true feel for RSS' effectiveness, you should try it as a stand alone solution. With a VB100 award, you should be confident of its quality and effectiveness. "Q3. * The combination of a standard AV + Sandboxie is more efficient, particularly when it comes to mid- and low-end cpu;..." Returnil Support: How is using multiple applications to try and achieve the same level of security "more efficient"? Loose the training wheels and give it a go as a stand alone security solution. On all test and production systems here and in independent testing, RSS has proven to be quite effective... @#22 (Deb): "Q. ...Get a hold of the Returnil 2008 Personal Edition if 2011 Pro gives you too much grief." Returnil Support: if you are looking for strict virtualization you should try RVS Lite 2011. It is closer to the RVS 2008 model, includes multi-disk virtualization with extras, an included stand-alone remote management console for use in isolated networks, a targeted System Guard feature that provides specific protection against virtualization circumventing malware, all in an installer less than 4MB! @#24 (Ansor): "Q. ... Annoying Returnil box popped up saying “Core stopped” which when coupled with the fact that shutting down the PC seemed to freeze the system meant I uninstalled it." Returnil Support: Please try another installation and if the same issues happen, send us the logs asked for in post #40. In the new install attempt, please try RSS Pro alone and include the result of this in your report to tech support address. Thanks in advance for the report and test. Hello people, I had a previous version 2010, I uninstalled it with Revo before installing this version. Ran ccleaner and winutilities registry cleaner to remove any leftovers. But when I try to install this version it says there are traces of a previous version which it has cleaned up and tells me to reboot and try again. Which I did a few times with the same result. Anyone any ideas? @#16 (Seannachie): "Q. I can’t get the interface to unlock in order to change preferences etc... Infuriating, as I’m doing everything I should do properly. Anyone any idea how to fix that – and, yes, I have read Returnil’s help file?" Returnil Support: Shoot a note to support (dash) tech (at) returnil (dot) com with your registered name, e-mail address, your License Number (if applicable), and your Installation ID (preferences > Advanced tab) and we can investigate at the server. @#18 (ed): "Q. ...I was storing everything to a virtual Z drive area and never had a problem after reboot until a month ago; after a reboot, I lost the whole Z drive and 25 GB of main drive space. Is there any way to recover something?" Returnil Support: Do you still have the rvsystem.img file on your computer? If yes, this is the actual file that becomes the Virtual Disk when mounted (open) in RSS. If it still exists, but is damaged in some way, you may be able to recover its contents using forensic recovery techniques. Outside of this, the data may not be recoverable. Unexpected hardware failure or corruption of files can happen for any number of reasons not related to the software you are using and is why we strongly recommend frequent file backups and making use of the System Restore feature in RSS. @#19 (dversa): "Q. ...Implementation of antivirus in a virtual system is useless and bog the system completely. In case of a virus you’ll lose the virus anyway during the next reboot." Returnil Support: This is not true as simply using a boot-to-restore solution provides absolutely no feedback on the presence of malware. Programs like WTF can only do three things: drop all changes, save some changes, save all changes. They cannot detect or block malware and do nothing for efficiently reducing the time to removal of that malware. Further, WTF and other ISR solutions are vulnerable to malware specifically designed to circumvent virtualization solutions. While this is also true for the Virtual Mode in RSS, we have included other components that cover these weaknesses. Virus Guard makes use of the single, true competency of AV/AM technology: detection and warning. As it is also true that there is no such thing as 100% detection, it is backed up in RSS with Anti-execute (allowed RSS to block activation of Stuxnet right out of the gate! ), The Virtual Mode (reboot to remove the changes except in the rare scenarios as described), and System Restore to get back to clean quickly. Hey Returnil!! Thank you for giving me a non-fixable bluescreen of death!! I will no longer support your products and will tell all my friends not to use your software!! @#11 (liste): "Q. Each new version of this seems progressively slower, more cpu intensive & more unusuable." @#12 (GOTD Fan): "Q. The most interesting thing is I can’t find the Exit button!" @#14 (Spredo): "Q. ...So, in order to use this program, the program must send information home to parent company. Information I do not know anything about. As often as it wants. And the only thing I can do about it is stop using the program." Returnil Support: All of us came out of the AV/AS and security communities so privacy was and is both a design and working priority. The information provided for client registration is used exclusively for license control and technical support; Malware sample and behavioral data is used exclusively for improvement of malware detection, blocking, and false positive reduction. Put simply, we are only interested in improving our solutions, the protection of our software, and your computer/network over the long haul - period. @#15 (cornjaco): "Q. The incorporation of an antivirus is allright, but only if it is really good. Does any-one know what antivirus they are using in the 2011 version?" 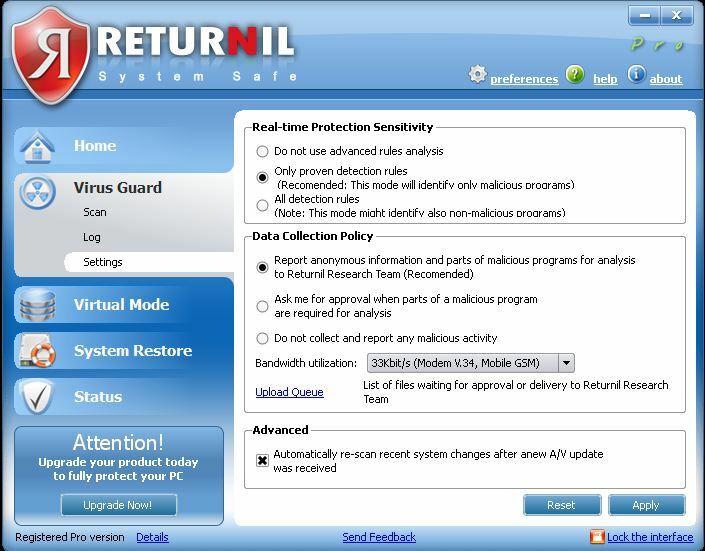 Returnil Support: The Virus Guard is a combination of the F-Prot AV engine and our own technology that makes use of Artificial Intelligence and machine learning in both the client and our servers. At the client level, Returnil updates are sent frequently based on analysis of data collected from users around the world and is a component part of the future development that will be true Distributed Immunity where the clients will be able to update each other when suspicious content is discovered; getting ahead of outbreaks, stopping them dead in their tracks. The VG in RSS earned a VB100 award for the August 2010 Virus Bulletin tests so you can be assured of its quality and effectiveness. @#11 (liste): "Q. Each new version of this seems progressively slower, more cpu intensive &amp; more unusuable." Returnil Support: As mentioned in the previous reply, too many applications make the system slow. Also, there is no reason to use RSS and WTF at the same time as it would be redundant and a very likely source of your performance issues. WTF is useless as a stand alone solution where security is concerned so the only way to compare them would be to pile on a seperate AV, AE, and System Restore solutions together with WTF and then determine the overall performance of your system. RSS is security, WTF is only instant system recovery... @#12 (GOTD Fan): "Q. The most interesting thing is I can’t find the Exit button!" Returnil Support: This is because there isn't one. You can stop the service in component services however if you do not want it to run. Try RSS Pro alone and use all the features to get a good feel for its overall purpose and how it accomplished the goal before you work to disable it or any features... @#14 (Spredo): "Q. ...So, in order to use this program, the program must send information home to parent company. Information I do not know anything about. As often as it wants. And the only thing I can do about it is stop using the program." Returnil Support: All of us came out of the AV/AS and security communities so privacy was and is both a design and working priority. The information provided for client registration is used exclusively for license control and technical support; Malware sample and behavioral data is used exclusively for improvement of malware detection, blocking, and false positive reduction. Put simply, we are only interested in improving our solutions, the protection of our software, and your computer/network over the long haul - period. @#15 (cornjaco): "Q. The incorporation of an antivirus is allright, but only if it is really good. Does any-one know what antivirus they are using in the 2011 version?" 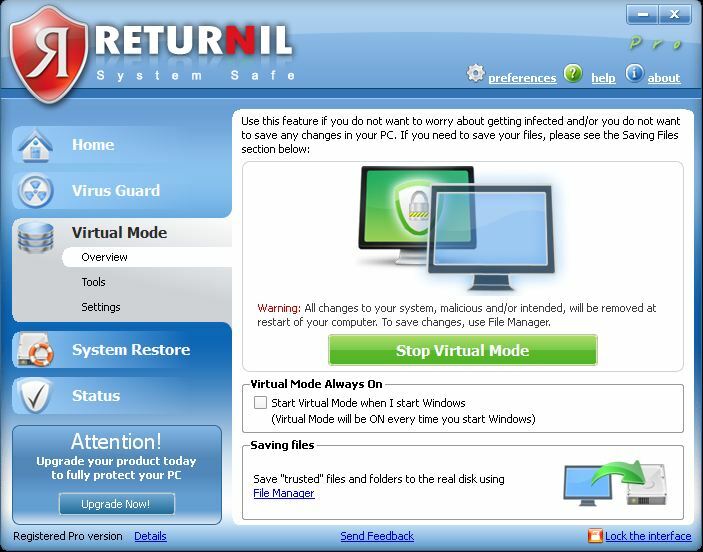 Returnil Support: The Virus Guard is a combination of the F-Prot AV engine and our own technology that makes use of Artificial Intelligence and machine learning in both the client and our servers. 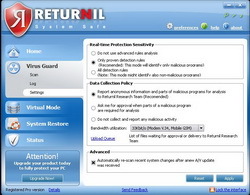 At the client level, Returnil updates are sent frequently based on analysis of data collected from users around the world and is a component part of the future development that will be true Distributed Immunity where the clients will be able to update each other when suspicious content is discovered; getting ahead of outbreaks, stopping them dead in their tracks. The VG in RSS earned a VB100 award for the August 2010 Virus Bulletin tests so you can be assured of its quality and effectiveness. @#8 - one more reply based on your post; the Virus Guard in RSS Pro is extremely efficient and effective. proof of this is the award of a VB100 in the August round of tests. @#9 (Hariks): "Q. Does anybody know whether it will edit MBR? I dual boot with GRUB [W7 and Ubuntu 10.4]"
Returnil Support: When you activate the Virtual Mode, RSS/RVS automatically protect the MBR by not allowing any changes to it and blocking low level sector edit attempts. Out technology (unlike others) does not use the MBR for virtualization or change tracking so you should not have any issues. You will need to have the Virtual Mode off when in Windows however to make changes to the MBR. When you boot into Linux, no issues should be present. @#10 (Sam): "Q. I installed the software, but it made my system slow down, it seems to be incompetible with Kaspersky. So I uninstalled the software..."
Returnil Support: RSS Pro and Kaspersky are compatible. We QC test against KAV regularly so we are ahead of any changes. With this said however, KAV can be resource intensive so using it in combination with RSS Pro on marginal systems may not be useful where performance is a priority. You should consider trying RSS Pro alone and then make a decision regarding which approach protects your system better over time. @#8 - one more reply based on your post; the Virus Guard in RSS Pro is extremely efficient and effective. proof of this is the award of a VB100 in the August round of tests. @#9 (Hariks): "Q. Does anybody know whether it will edit MBR? I dual boot with GRUB [W7 and Ubuntu 10.4]" Returnil Support: When you activate the Virtual Mode, RSS/RVS automatically protect the MBR by not allowing any changes to it and blocking low level sector edit attempts. Out technology (unlike others) does not use the MBR for virtualization or change tracking so you should not have any issues. You will need to have the Virtual Mode off when in Windows however to make changes to the MBR. When you boot into Linux, no issues should be present. @#10 (Sam): "Q. I installed the software, but it made my system slow down, it seems to be incompetible with Kaspersky. So I uninstalled the software..." Returnil Support: RSS Pro and Kaspersky are compatible. We QC test against KAV regularly so we are ahead of any changes. With this said however, KAV can be resource intensive so using it in combination with RSS Pro on marginal systems may not be useful where performance is a priority. You should consider trying RSS Pro alone and then make a decision regarding which approach protects your system better over time. I haven't tried this version yet (but plan to), but in previous versions I turned off the antivirus since I already had dedicated antiviruses, and the program ran well. Interestingly it is now using a "cloud" to help detect viruses, which I do not remember it doing before. They also seem to have made the virus protection part of the free version and the pro version just gains access to the file recovery manager & restore/rollback feature. @#6 (Damon): "Q1. The program froze twice and I had to force end tack on it both times." Returnil: Does this happen with the Quick Scan at installation or at a different time? If the former, the user may see what appears to be a GUI freeze. This is not actually a functionality freeze as the scan progresses even though the GUI appears frozen. Give it about 5 minutes and it should clear, showing the results screen and buttons to move forward. **Click START > RUN > Type MSINFO32. On the System Information screen click FILE > Export and then save the file where you can find it to attach to your reply. "Q2. I continued using the program but stopped using it after I saw this message: http://tinypic.com/r/2lkqs2g/7"
Returnil: This message is expected when the Virtual Mode is activated. It is simply a "heads up" message so the user is fully ware of what the Virtual Mode does and what will happen at restart of the computer. It is not an error message and should not be a reason to uninstall the software. @#7 (Bruised Leaf): "Q. Could this program be used in the same way as Sandboxie, specifically using it when trying out new software so that we don’t cause any permanent damage if that new software doesn’t quite go well with the system? I’ve been looking for a free alternative to Sandboxie." Returnil: As in my previous reply to #4, RSS Pro and SBIE are fully compatible and offer a unique level of control and protection when used together for the scenario you are interested in. SBIE works to sandbox a target program and RSS Pro works to ensure that nothing effects the real system. @#8 (r0lZ): "Q1. 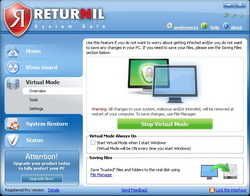 The problem with the philosophy of Returnil is that you have to know that you will do something potentially dangerous and you must enable the protection manually..."
Returnil: As you note, the setting can be activated that starts the Virtual Mode with Windows and is actually the way the program should be used: with all features activated so you are covered properly. RSS is an integrated solution and not just another boot-to-restore or sandboxing solution. The goal is long term protection, not short-time restore. "Q2. ...I you forget to enable it, the virus will have access to your real system. In the other hand, if you enable the protection systematically (for example with the option to enable it when Windows start), then everything you do is saved in the virtual area, and when a virus attacks your computer or when you reboot, you lose everything!..." Returnil: You miss the point even though what you say has some validity. When the Virtual Mode is off or you do not sandbox the suspicious application with your suggestion of SBIE as an alternative, the system is vulnerable to "permanent" changes. This is why RSS include a Virus Guard with Cloud based updates, Anti-execute, and System Restore functionality to (in order) detect potential malware, block potential malware from activating, or to restore infected files and/or the entire system if required. The goal of RSS Pro is long term protection and does not rely on a single technology or approach to security. All single tech solutions have weaknesses that must be accounted for if your system is going to remain clean over time; why slow you system down with multiple solutions when only one is actually needed? "Q3. ...OK, it is possible to save your work outside of the protected area, but you have to manually copy it, and anyway there are many things that you cannot save yourself. (For example, if you change the configuration of a program, it will be stored in the virtual area, and it is usually extremely difficult to copy it in your real system.)..." Returnil: You will be happy to know that the next build release of RSS Pro will contain automation for the File Manager where you can set an option that will save current changes to the real disk at log off and/or shutdown. For program data, many applications allow you to change where this data is kept. It is also good to try your changes before making a permanent change to the real disk so you simply need to deactivate the Virtual Mode, make the changes you want to keep, and then re-enable the Virtual Mode when satisfied. Most real changes are infrequent as most users rarely change their settings. For things like browser preferences and/or user mode adjustments, simply export a preferred profile and configure the browser to load those preferences when it starts. This is not difficult to do and is part of the thinking you need when your goal is long term, real security rather than simply being focused on the here and now. "Q4. ... Therefore, I think that the Returnil system is only useful to install a new program in the protected area to check it, and if it suits your needs, then you have to reboot and install it again, this time in your real system. That’s great, but as an antivirus, Returnil is not efficient, or you must constantly enable or disable the protection, and reboot many times..."
The pro version of 2011 has implemented the System Restore function, but it does not exist in the Free version. I do not know how well this new System Restore function does. It has been long known that Returnil kills the System Restore points of the Windows Operating system. That is the most disappointed part of the Returnil. To #17 The pro version of 2011 has implemented the System Restore function, but it does not exist in the Free version. I do not know how well this new System Restore function does. It has been long known that Returnil kills the System Restore points of the Windows Operating system. That is the most disappointed part of the Returnil. I think that there is a way for you to get your files in the virtual Z drive back if you did not choose to delete the virtual drive. It happened to me before. Try to re-install the Returnil (the original version that you used). You may find that you can not save new files to the Z drive, but you can make some modifications in Returnil settings, then you can save again. The virtual Z drive is actually a big file in size. Returnil fools the operating system to believe that Z is actually a drive. #18 I think that there is a way for you to get your files in the virtual Z drive back if you did not choose to delete the virtual drive. It happened to me before. Try to re-install the Returnil (the original version that you used). You may find that you can not save new files to the Z drive, but you can make some modifications in Returnil settings, then you can save again. The virtual Z drive is actually a big file in size. Returnil fools the operating system to believe that Z is actually a drive. Whats the difference between this and "System Restore" on my Vista machine? Anti-virus in a virtual system is oxymoron, why you ask, well it defeats the purpose of virtual parallel operating system by occupying memory and then destructs itself when shut down. How would you know that there was something wrong with the site visited or new program installed that was causing the problem. Furthermore, constantly rebooting back and forth is nuisance and many times you will mix them up and install or download into virtual machine and then lose it. According to my tests, the software is CPU intensive and takes up to 33% of the CPU time slices and makes everything runs to slow, like you are using an inferior computer. If you load Winword or any spread sheet software, good luck with it, your system will freeze. Not worth it to even try it, you will mess up the original registry and cleaning it is a time consuming. Anti-virus in a virtual system is oxymoron, why you ask, well it defeats the purpose of virtual parallel operating system by occupying memory and then destructs itself when shut down. How would you know that there was something wrong with the site visited or new program installed that was causing the problem. Furthermore, constantly rebooting back and forth is nuisance and many times you will mix them up and install or download into virtual machine and then lose it. According to my tests, the software is CPU intensive and takes up to 33% of the CPU time slices and makes everything runs to slow, like you are using an inferior computer. If you load Winword or any spread sheet software, good luck with it, your system will freeze. Not worth it to even try it, you will mess up the original registry and cleaning it is a time consuming. You're right. Returnil removed the "Exit program" in 2011 version. I found this when I tried the free version of 2011. I can not leave a comment to the "Share your ideas". So, I leave my comment here. Returnil, please bring back the "close, exit, or quit the program" by clicking the program ICON located on the bottom right hand corner of the taskbar, so we can quit the program whenever it is not in protection mode. The option was in 2010 version. I could not find how to quit the program in Task Manager (its Processes). To #12. You're right. Returnil removed the "Exit program" in 2011 version. I found this when I tried the free version of 2011. I can not leave a comment to the "Share your ideas". So, I leave my comment here. Returnil, please bring back the "close, exit, or quit the program" by clicking the program ICON located on the bottom right hand corner of the taskbar, so we can quit the program whenever it is not in protection mode. The option was in 2010 version. I could not find how to quit the program in Task Manager (its Processes). First, thank you for the questions and comments. All feedback is greatly valued. @#1 (Hariks): "Q. What happens after the subscription expires (one year normally)? ...Is is the same for this [2011 pro] also ?" Returnil: Yes, once the subscription period has ended, the software will revert to the same feature set as RSS Free 2011. @#2 (Grenfell): "Q. Can the Virtual OS be mounted on Ext HD?" Returnil: No, the virtual cache for the System must be installed within the System partition. In RVS Lite 2011 we include multi-disk virtualization that supports creation and maintenance of virtual caches for non-system disks on a different non-system disk but still requires that the system virtualization be installed within the system partition. We are working to upgrade RSS Pro with this capability in the future and are also working towards full solid state drive support that would allow the scenario you are interested in. @#3 (Tall53): "Q. ... It was great until all the AV extras were added but now it seems to slow every machine I have installed it on." @#4 (Kevin): "Q. Doesn’t SandBoxie basically do the same thing?" Returnil: No and a little bit yes. SBIE is not a boot-to-restore solution. It works to place specific applications within a protected sandbox rather than virtualizing the entire system. RSS Pro/Free and RVS Lite 2011 are fully compatible with SBIE however and many users find the combination useful and effective when evaluating new programs and/or malware samples. Hi all, First, thank you for the questions and comments. All feedback is greatly valued. @#1 (Hariks): "Q. What happens after the subscription expires (one year normally)? ...Is is the same for this [2011 pro] also ?" Returnil: Yes, once the subscription period has ended, the software will revert to the same feature set as RSS Free 2011. @#2 (Grenfell): "Q. Can the Virtual OS be mounted on Ext HD?" Returnil: No, the virtual cache for the System must be installed within the System partition. In RVS Lite 2011 we include multi-disk virtualization that supports creation and maintenance of virtual caches for non-system disks on a different non-system disk but still requires that the system virtualization be installed within the system partition. We are working to upgrade RSS Pro with this capability in the future and are also working towards full solid state drive support that would allow the scenario you are interested in. @#3 (Tall53): "Q. ... It was great until all the AV extras were added but now it seems to slow every machine I have installed it on." Returnil: The comparison does not hold with WTF as the purpose of RSS and WTF are different. WTF is application level virtualization, only provides boot-to-restore functionality, and is vulnerable to specific types of malware that are designed to circumvent software based virtualization. RSS on the other hand is a complete, intelligently layered security solution where each component part is designed to cover the inherent weaknesses in the other component parts while working to keep your system clean over the long haul. WTF needs help to protect your system, RSS Pro 2011 does not... @#4 (Kevin): "Q. Doesn’t SandBoxie basically do the same thing?" Returnil: No and a little bit yes. SBIE is not a boot-to-restore solution. It works to place specific applications within a protected sandbox rather than virtualizing the entire system. RSS Pro/Free and RVS Lite 2011 are fully compatible with SBIE however and many users find the combination useful and effective when evaluating new programs and/or malware samples. If you installed Wondershare Time Freeze a few weeks ago DO NOT install this. It caused issues on my machine and I had to do a system restore.